The Toyota Hilux and Land Crusier was built for the Aussie outdoors. We know that you’ll be facing some extreme conditions and that is why we produce the highest quality Toyota neoprene car seat covers. 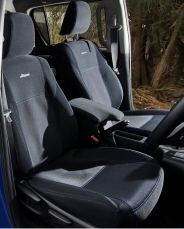 Whether it be hitting the sand, mud, red dust, and dirt, know that Wetseat have you sorted with the best Hilux and Landcruiser Neoprene seat covers to protect your interior while you play. Our neoprene car seat covers Toyota Hilux and Landcruiser models including the SR5, Workmate, Rogue, Rugged, Rugged X, SR, and TRD. Additionally, we cover the Toyota 79 series Land Cruiser, GX, GXL, Sahara and the Toyota Prado Kakadu, the iconic cars for the Aussie way of life. We have aligned needs of the Toyota car seat covers to work with your specific lifestyle. We aim to not only produce aesthetic seats, but also practical, safe and durable ones. We use 2.7 UV safe neoprene car seat covers that are also highly water, abrasion and chemical resistant. 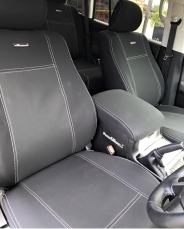 The Wetseat Toyota neoprene car seat covers are fitted specially to the Toyota Hilux and Land Cruisers and ribbed with sharkskin grips to ensure no movement while on the seat. Here at Wetseat, we are Aussies, making for Aussies and we make sure that our car seats go above and beyond Australian and International standards.